I began seriously preparing for my upcoming mission during the month of June. Many of my clothes I had already purchased. Much of the preparation was getting the new home and yard in order and taking care of immunizations, new glasses and things like that. The month was busy and fun since I had Micaela and her children with me as I returned from Hawaii on May 30th. Arriving the same night was Julie and her family from Nauvoo Illinois. We all met up at my home about 10 PM. What fun it was to have these two daughters and their families who live so far away! On the 4th of June, my niece Becky Evans, and her family moved into the basement of my home and Micaela's husband came from Hawaii in the middle of the month. Becky and Adam will live in my basement and care for my home and yard while I am gone. We did a fair amount of playing while Micaela's kids, Haley and Becky's kids were all here and that was so fun. Stephen Mulder, my oldest grandson got married on June 1st and his reception was the night before on May 31st. The reception was at Jill's place up in Woodland Hills and it was beautiful. The wedding in Manti was also very special. I really liked the idea of having the reception the night before and focusing solely on the temple wedding the next day. 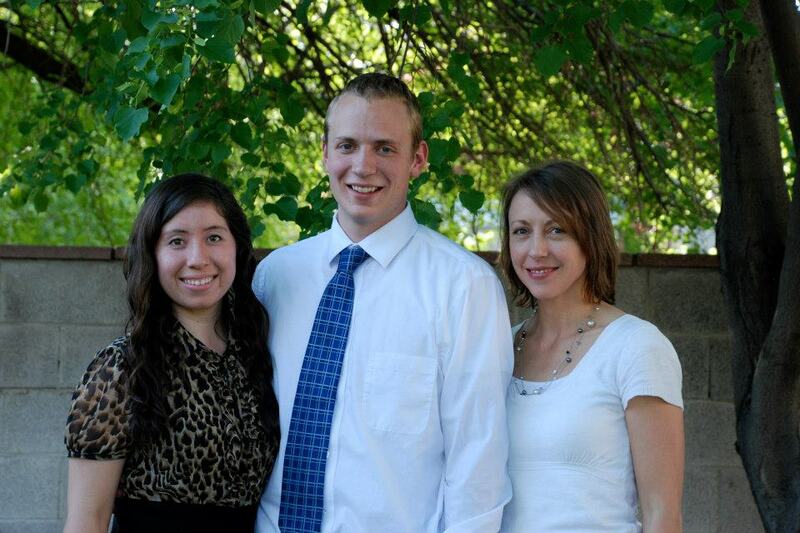 Michelle just graduated from BYU and Stephen is attending BYU. We celebrated Stephen and Caleb's birthdays on the 17th of June at Jills. Kate dressed up the guinea pig and dog in party hats. I had a chance to connect with several special friends and relatives before I departed to Fiji. I had my local children and their children to my home on the 2nd for a birthday party for Hannah and Gracie. Dave's niece's boy Jaden had a farewell in mid June. Dave's sister Lisa's youngest boy Christian received his endowment at Bountiful Temple prior to a mission and I attended. My friends Alison, Lorna and Sylvia Huntsman visited from Fillmore to see the new home. So fun to see people from home. There was a cousins get together on Dave's side. Present were Dave's Aunt Janet who is almost 90, Dave's mother who was soon to turn 92 and his aunt Lola who was soon to turn 96 . It was the 96 year old who planned the party. Dave's sisters and sis-in-law and several cousins were there. A week later we gathered for Dave's Mom's birthday on the 21st. We had a backyard get together. I spoke at church in Fillmore on the 23rd. That was a wonderful reunion with friends and warmed my heart. Greg and Sue Roper who are buying my home in Fillmore hosted an open house for me at that home which made it even more special. This is John's little Owen and Paul's Zach playing in my twirling chair. I also had a special reunion with Paul and Jean Hanks who were special friend when we lived on Capital Hill in SLC after our time in Washington DC. I was hoping to get together with Ada and Doug Chabries but instead he went into the hospital for triple by-pass heart surgery and has done very. On the 4th of July, Micaela, Jill, Challis and Paul and their families and I went to Fillmore for and old fashioned Fourth of July. After the parade and visiting in the park, we all went to Watsons for a reunion. It was wonderful to relax and enjoy the company of Kerry and Tafta along with Jenna, Seth and Janet with their families. We haven't all been together for a long, long time. Micaela and Travis left from Fillmore to move to their new home in Maryland. During June and July Millcreek Gardens was finishing up landscaping my yard, while, Adam, my niece's husband, was busy putting up a long slide, making grow boxes, putting up a shed and doing other projects in the yard. I now have three apple trees, two peach trees, a pear and an apricot tree, asparagus, rhubarb, grapes, raspberries, strawberries, boysenberries and blueberries. I had a couple of other special reunions. 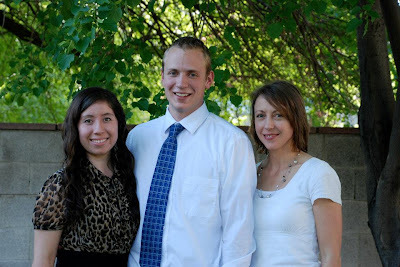 The Sunday before I entered the MTC, Jill and kids and I visited with grandma Smith. From there Jill and I went to visit with Brent and Jody Tennant in Farmington. Brent was the bishop when Dave served in the bishopric of the old 19th Ward in SLC when he was in medical school. Brent has had some major health issues and it was just so fun to spend time with him and his sweet wife and daughter. I entered the MTC on July 8th. 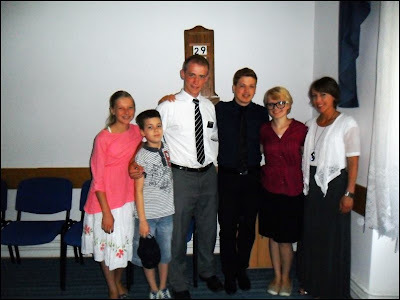 It was weird to be going all alone to the MTC but I met up with my companion Pat right as we both arrived. What a wonderful week of "Preach My Gospel". Each day was filled with spiritual experiences and new insights. The second week of the MTC for me was spent in SLC so I returned to my home after that first week and all my Utah kids and granddads gathered for a final goodbye. We all went swimming and then to the movie, Ephraim's Rescue on Saturday. Sunday we met at Paul's for dinner and a FHE about the movie we had seen. I commuted to downtown SLC each day for medical training. The plan was to fly out on Friday or Saturday but my companion's visa did not come and we actually didn't leave until the next Wed. That gave me a little more time to fine tune the packing and get a few more things done. I felt prepared by the time I left. I got to go to Lyndee's 12th birthday party on the 19th which had the theme of 'A Masquerade Ball' and see Jake participate in his first triathlon in which he took first place over-all. Dave's step-brother Joel and his wife Marni were in town with some family on the 21st and 22nd for Marni's mother's funeral. We got together on the 21st for a fun get-together. Joel is Pres. of the Bismarck, ND Temple and we don't get to see them very often. Jill and her daughter Kate were also flying out on Wed. morning to get Jordan as he finished his mission in Croatia. I gave them a ride to the airport, returned to finish cleaning my home and then Paul and family took me to the airport where John met up with us. 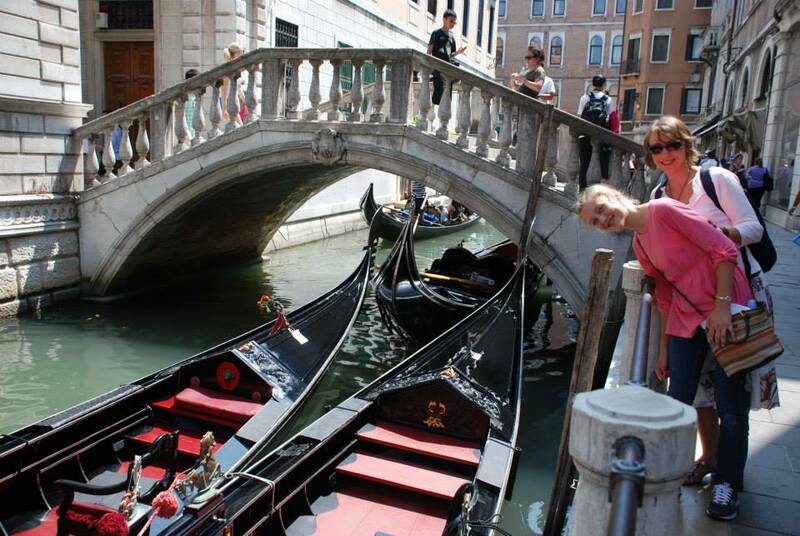 Here are Kate and Jill in Venice a couple of days later. Jordan with family and friends in Croatia. They are on their way home as I post this. The flight to Fiji was great. Even the flight through the night went quickly and I got a few hours of sleep. We had a total of three flights to get to Suva, the capital. There to meet us were the Whitings who we will be replacing. They put us right to work learning the ropes. We didn't get to sleep until Friday night about 9 pm but I felt great all day. We slept well and woke up mostly adjusted to the 18 hour time change. Pat was sick with a cold when we left and she didn't feel good for a few days. Sunday evening I started getting sick and Tuesday I was miserable but that was about it. The beautiful Fiji Temple is across a small parking lot from where we are staying and fill the view of our large picture windows! What a sight to behold. We have stayed this first week at the patron housing for the temple as our flat will not be ready until Wed. for occupancy. The building also houses the mission office where we will work each day. Pat outside of our office building which is on the temple lot. Whitings were wonderful and spent every minute they could with us Monday through Thursday. There was a lot to learn and we both took notes like crazy to remember all that we needed to know. I have been taken around the downtown, visited both the private and public hospital, been introduced to a great local dentist, and started to learn to drive on the left side of the street! We have been treated royally by all the missionaries and find this country stunningly beautiful. The friendliness of the people is amazing and I find myself very attracted to both the native Fijians and the East Indians who make up 44% of the population. The Indians were imported by Britain in the late 1800's to work the sugar cane plantations. They are not allowed to own land so we find them mostly in the cities where they run the majority of the businesses. We have had 4 meals at the Mission Home with President Klingler and his wife and several with senior couples, both at restaurants and at their homes. Our kitchen and dining room at patron housing. We moved into our new 'flat' Wednesday afternoon but then had activities until late evening. We didn't really get settled until Saturday. Saturday we also went o our first baptism here. The font is in the court yard of the church-owned elementary school here. The chapel at the school serves the school and two wards--a Fijian and an English speaking ward. We have been attending there for two weeks but were just assigned to a new ward. I'll sign off with these photos.